Willowbrook, Illinois, January 19th, 2013. It's cold. There is a forecast of snow. It's the middle of another Northern winter. Sounds like a great place to have a coaster bash right? 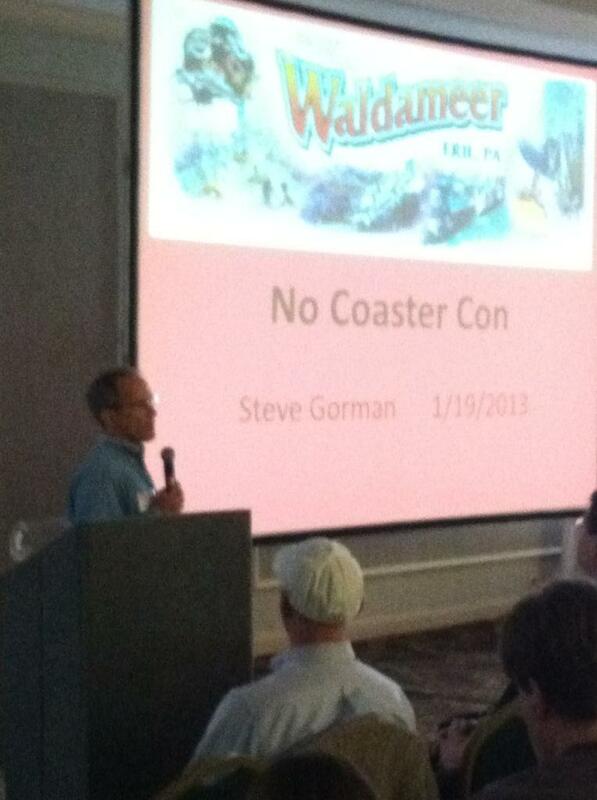 It's what the American Coaster Enthusiasts call "No Coaster Con" and the name says it all. These coaster and themepark fanatics love the amusement industry so much, that even when they can't ride, they still want to talk about their passion; coasters. Beginning at 9:00am, this ACE event brings speakers and invitees from parks and manufacturers across the country to give insights and tell stories about their business. Parks such as Silver Dollar City, Dollywood, and Schlitterbahn Waterparks and manufacturers like Philadelphia Toboggan Coasters and Sally Corporation all joined the festivities to give updates. Of course, Waldameer & Water World was excited to be invited again to this awesome event as well. Steve Gorman gave an insider's look into Waldameer's 2012-2013 off season including photos from the installation of Waldameer's new ride, the Music Express, updates on the overhaul of the Ferris Wheel, and the re-tracking process on the Ravine Flyer II. All these juicy details and more were shared, giving the ACER's something to talk about until summer rolls around again. Also, be sure to follow Waldameer on Facebook, Twitter, and YouTube for even more about Erie's favorite amusement park! Providing affordable family fun for everyone is a tradition that Waldameer & Water World prides itself in. Enjoying a day at the park with family and friends is what Waldameer is all about! To make sure every Guest that comes through our gates is able to enjoy our park, we have always made sure to do everything we can to make all aspects of the park accessible, especially for our Guests with disabilities. 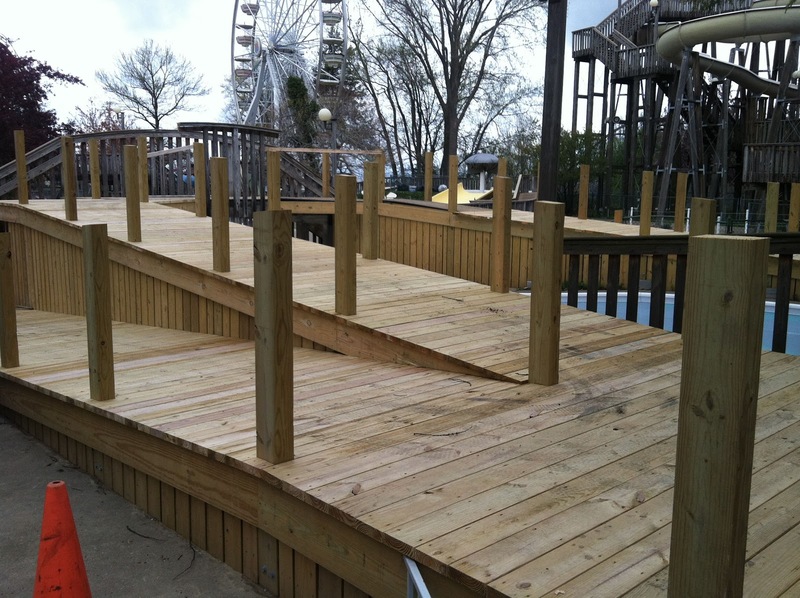 Providing special entrances to our attractions, building ramps, clearing pathways, and offering special wristbands for Guests who cannot wait in lines are only a few of the things we make available to make sure all our Guests enjoy everything Waldameer has to offer. This coming March, the ADA (American's with Disabilities Act) will revise and update it's codes and laws pertaining to water attractions and accessibility in water facilities. These new rules update codes on ramps, pool lifts, and many other aspects of water facilities. To make sure Water World continues to be accessible to all our Guests, Waldameer has made many changes in the past few years. The largest addition was the construction of the over 100' ramp to allow access to Water World's kiddie pools and Giant Body Slides. Another change was the Endless river bump steps allowing Guests in wheelchairs to "bump" down into the pool. 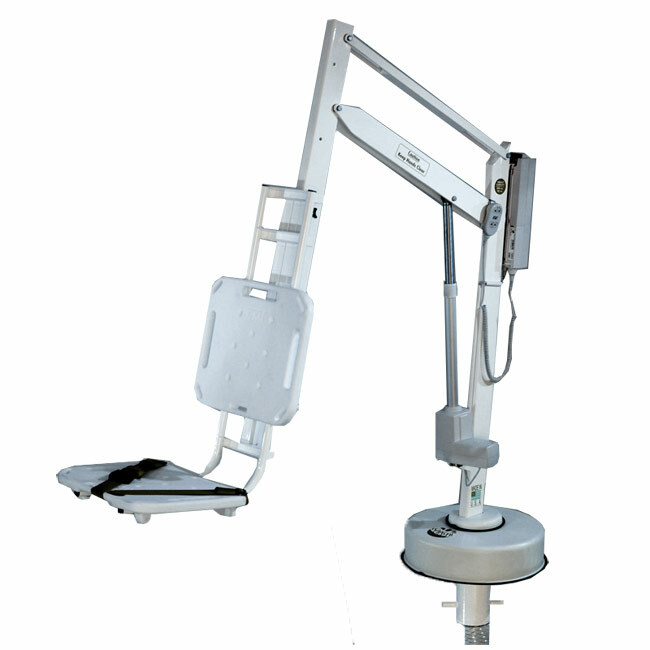 An example of a pool lift that will be installed at the Heated Relaxing Pool and the Inn's pool. To make Water World's kiddie pool more accessible, the installation of a ramp was added to the pool. This will allow water wheelchairs and Guests unable to negotiate steps to enjoy the kiddie pools as well. Still to come for 2013 is the addition of two pool lifts to allow access to Water World's Heated Relaxing Pool as well as the Inn at Presque Isle's swimming pool. These lifts will be able to pick up a Guest and raise them into each pool so they can enjoy the water. These changes will cost over $15,000.00, but are well worth it in Waldameer's eyes. The more accessible Waldameer becomes, the more smiles and memories we can be a part of!